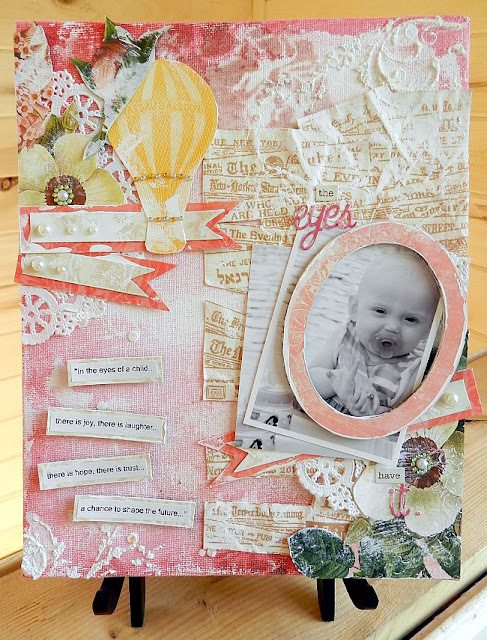 Erin Blegen: My Scrap Cabin: Webster's Pages Mixed Media! Good morning, sweet friends!! I've got a post up at the Webster's Pages blog for the first time, and let me tell you- THAT is exciting!! I got to work with their beautiful new Park Drive collection, and decided to go in a different direction with it, using an 8x10 canvas. I've also put together a little tutorial for you to give a little insight into how I achieved my background. Step 1: Mix red and pink gelatos together, applying color to the edge of the canvas. Spritz the canvas with water and use your finger to blend colors together. Step 2: Apply gesso. I simply scooped some up with a folded scrap of photo paper and scraped it across the canvas. Some punched bits of paper got mixed in with the gesso, but the smattering of confetti was okay by me :). Then I crumpled the paper and then added it to the canvas. Next, I cut the hot air balloon from the B-side of th paper along with some of the flowers on THIS SHEET, our Margaret paper. A few banners, a touch-up of gesso and the canvas is photo ready. I loved this little quote from Air Supply - sometimes I just like to sit and peruse the internet for quotes and poetry related to kids...just to get me thinking, and to remind myself of how fortunate I am to have three little ones to call my own :). Step Five: Add some texture paste to the upper right and lower left areas of the canvas, giving the canvas that last bit of detail to make it even more interesting. Just add some bling and pearls and you're set! 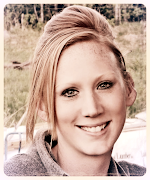 Erin, this is such a wonderful project! All that yummy texture and WP goodness makes an a awesome combination. Love the tutorial, too! Oh, this is really beautiful! 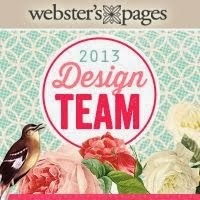 Your first project for Webster's Pages is already a stunner! I love your canvas! The different textures on the background look so beautiful and I also like your journaling. This is just gorgeous! What a lovely thing to have on your wall! Beautiful background you created with the Gelatos! You are off to a wonderful start with Webster's Pages. Oh thank you for the step by step, I always enjoy watching the process, and seeing the creation come together.. this is really beautiful.. and the quote is so lovely too!! Lovely canvas Erin! Looks like a lot of work putting together that step-by-step - Good for you :) Saw you @ WP!! this is so stunninG! LOVE the colours you have used and the way you created the background. Beautiful! Thankyou also for sharing your 'how-to' process. Greatly inspiring. Stunning Erin! I love that you gave us step by step guide. Thanks for all your inspiration! 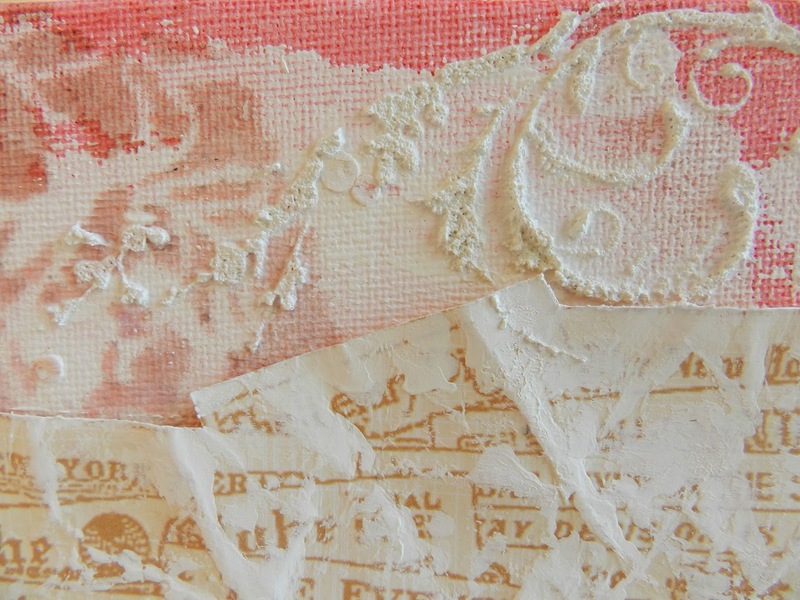 I love mixed media projects, thank you for sharing the process!